Removed my favorite menu item. Sausage tortellini. Donna is the best server. She pays close attention to our needs and we never had to ask for anything. Food and service were very good.....place was almost empty [a typical Tuesday eve?] Ordered Shrimp Scampi and salad...both were served as ordered. Minor point....bread accompanying Scampi dish was stale as was the bread served pre-meal. The food we received was cold and one entree was incorrect. The steak was very salty and the other meals had little flavor. The desserts we received were still frozen and flavor was okay. Overall, there are other Italian places that have much better food for the price. The quality has gone down significantly downhill and we will not be planning to return. Our server was awesome. The service was great! The waitress was responsive. The food was good. 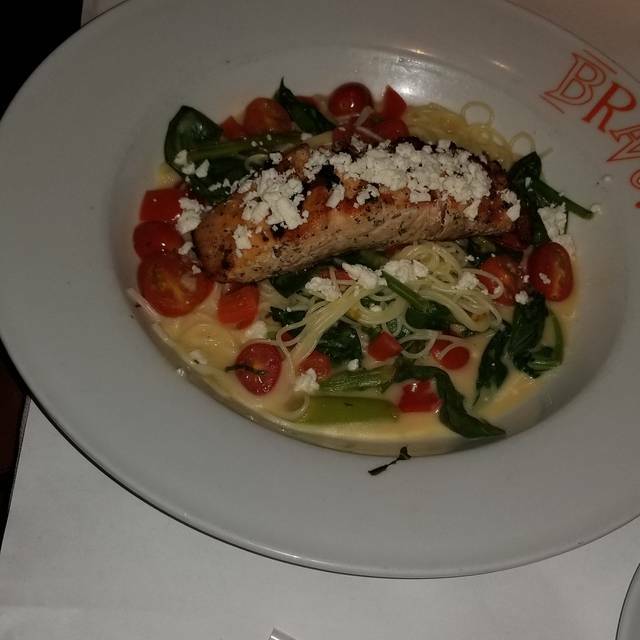 Bravo's is one of our favorite restaurants in the Fredericksburg area. The food is always good and the serving staff friendly. The menu offers a wide variety of choices including pastas, pork chops, grilled salmon, and shrimp. Their loyalty program is very generous. 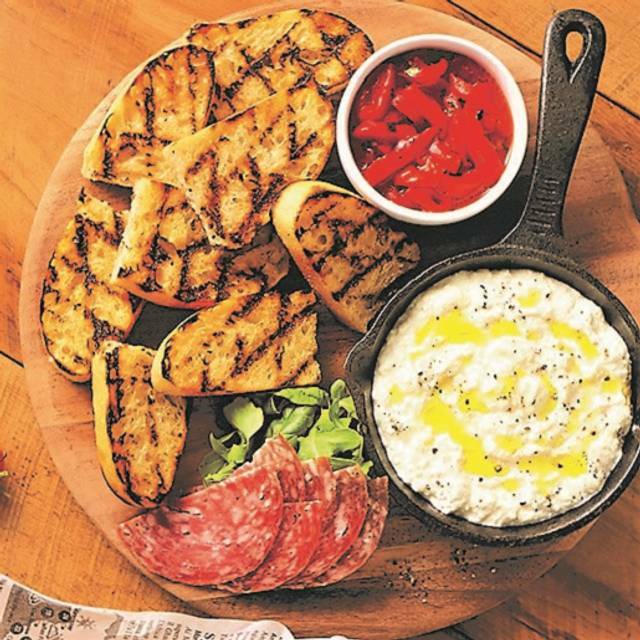 We often receive $10 off or a free appetizer. Look forward to our next visit! Get together with some family, it was excellent as always! Great service! Staff was helpful and friendly. I made a reservation for a group of eight, and Bravo put us, unasked, in the private room. That was so perfect for us! The table in that room is round, so everyone could hear everyone else easily. The food selections, taste, appearance and value were spot on. Every time someone recommends a place to eat, I tell them to try Bravo. 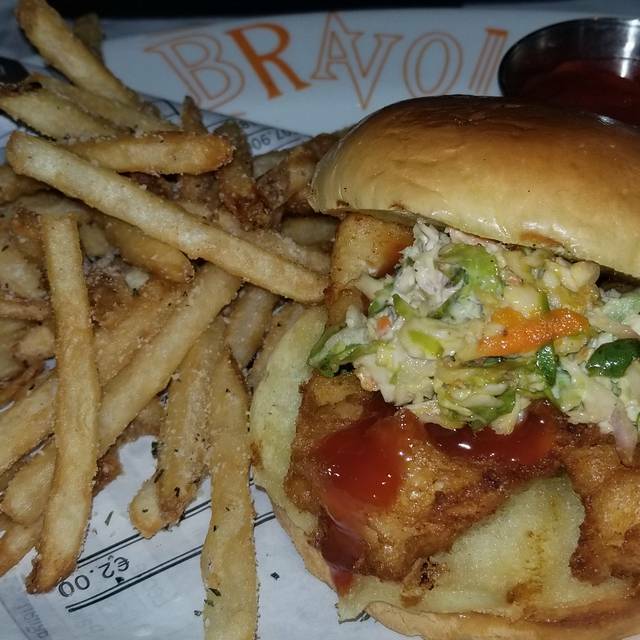 Bravo used to be one of my favorite restaurants to come to. It seems like a totally different restaurant. The service isn’t the same. The cleanliness isn’t the same and the food isn’t prepared as well as it usually is. We showed up with a party of 7 when we only scheduled for 6. The staff was very gracious about accommodating us to a larger table. Our server tried to keep up with everybody's initial orders and then changes. Unfortunately one of them was incorrectly taken and had to be sent back. It took a little longer than the three minutes the server said it would. Noise was Extremely Loud due to a table with three small children, all who were being very unruly. Not the restaurant's fault, but it made for a difficult to have conversation. 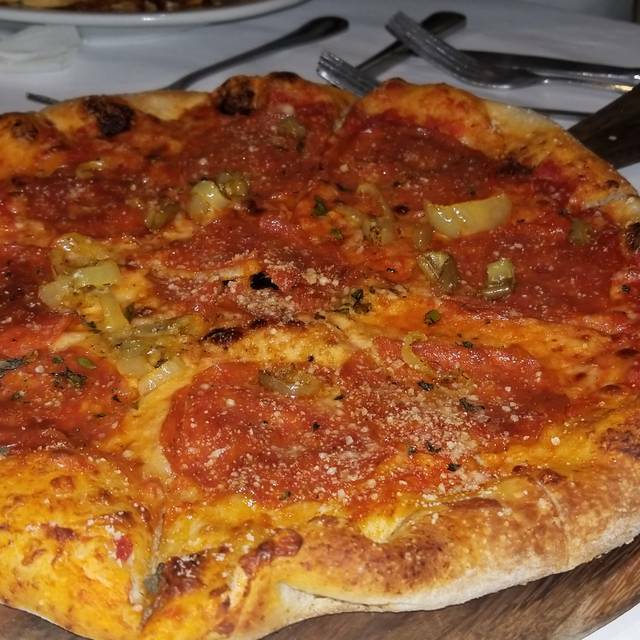 We very much enjoy our meals at Bravo's and will always come back for another fine meal. Decent but slightly overpriced food. Food was quite slow the evening we went but perhaps they were having a bad night. We have been to this Bravo on several occasions with friends and we are always overly delighted. The lobster bisque is the best we have ever had and your pasta dishes are exquisite. The service is outstanding and the atmosphere very comfortable and inviting Many thanks and see you again soon. We had an amazing experience from the time we got there until the time we left. 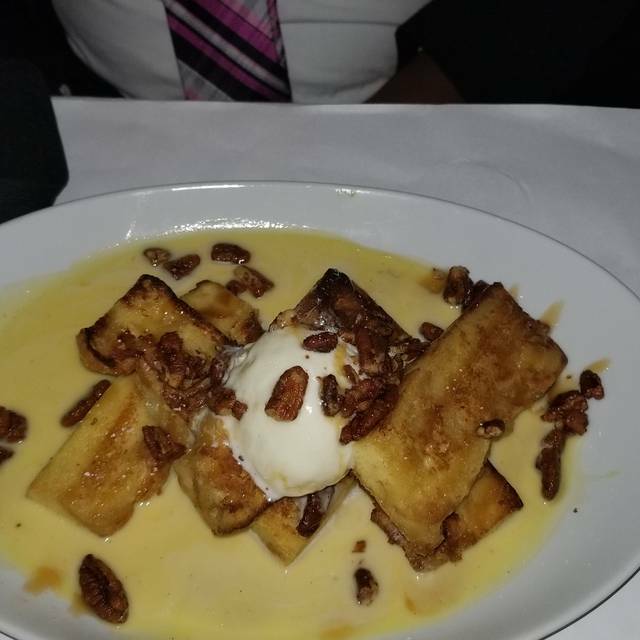 The food was great and the dessert was outstanding! We always enjoy coming there! Food is always great! Very nice atmosphere and great service will come in again. Enjoyed the entire experience. Waiter made us wait too long to come and greet us. Waiter lied about not being our waiter. Waiter was just very slow! Greg (our server) was excellent and the food amazing. So much better than a few years ago. Took my wife and kids here for Valentine's day dinner. Very prompt seating with a reservation. Food was excellent like always. However,the server seemed to be over whelmed. The server could not keep up on drink refills and bread as well as she forgot several times the extra request I asked for. This was one of the most elegant places we have ate at in FREDERICKSBURG, staff is amazing food is great at a good price . Bravo was a bustling place on Valentine's Day, although we did not feel at all squeezed in or hurried. Waitstaff was attentive & professional as always. Food was excellent. An enjoyable experience! Food was very tasty and there were many options. Nutritional information provided. Service was responsive and timely considering the Valentines crowd. Prompt service and the Waiter was very complimentary. The food could have been a little hotter temperature wise, but good nonetheless. Since the restaurant wasn’t crowded I should’ve been able to sit in a booth. Food was delivered warm at best. Warm soup. Calamari appeared half cooked; definitely not fried enough, Flavorless. Glad I had a gift certificate. I would never go there again. So many better choices. Burger King would have tasted better!! 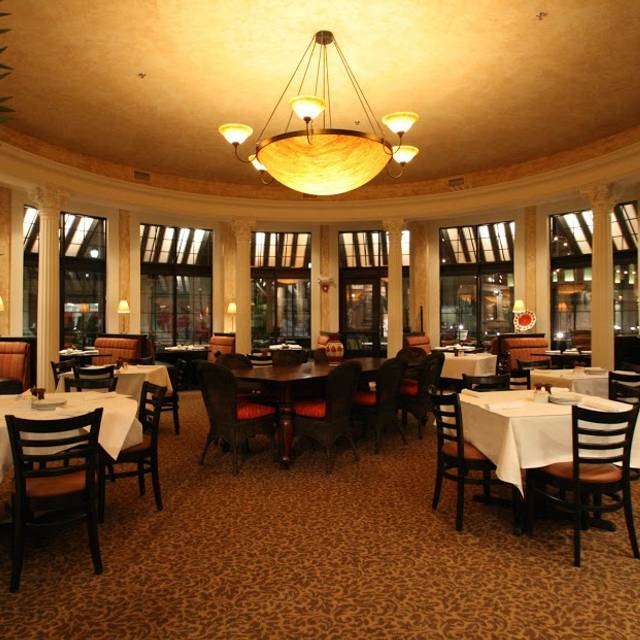 Bravo's is a great place for all events, ranging from informal get-togethers to large group celebrations. The food has been fresh on each occasion and the hospitality team is appropriately attentive. The restaurant's location makes it an easy pair to shopping, catching a show, or a leisurely stroll through the town center. 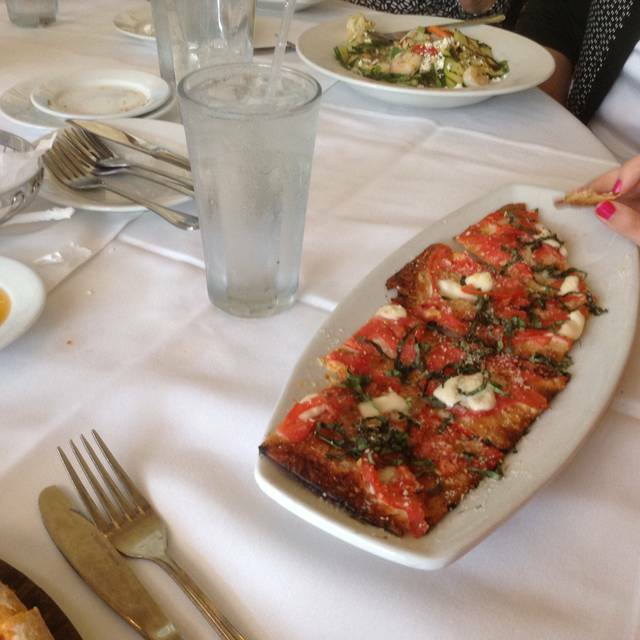 Bravo's is the perfect choice for quality meal with loved ones and friends. It was very cold in restaurant, dishes were dirty (grit on outside of glasses and dirty silverware) and food is pricey for what you get. Over all great experience, food and service were great. My wife had filet and she really enjoyed it, I had salmon which was awesome. Very happy with our meal. My husband and brother in law got the $29 steak. My husbands was supposed to be medium and was rare-medium rare. My brother in laws steak should have been medium rare and was so rare it was cold. Blue-rare for sure. No water refills, no pre-bus. Disappointed as the location is nice and atmosphere is great too. Much rather go across the street to Firebirds. Our family ate at a different location a few months ago and my daughter has been asking to find a location close to our home. 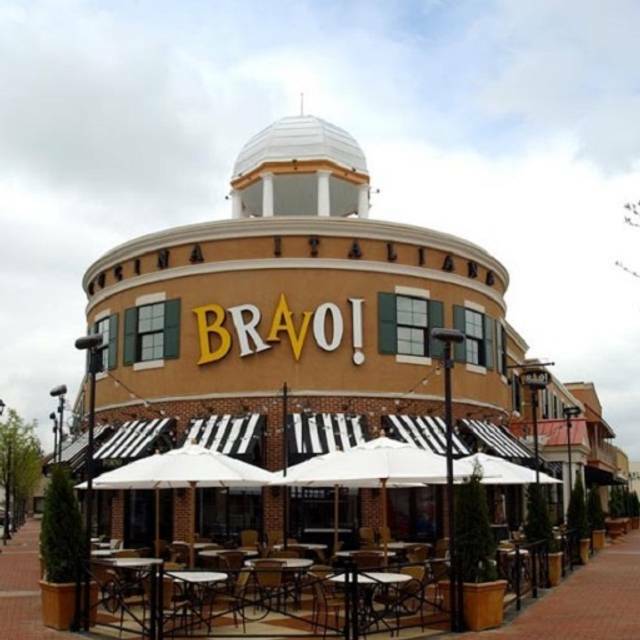 The closest one is 26 miles away and her request for her special birthday meal after looking at menus in Washington DC and NoVA was to drive to Fredericksburg to go to Bravo. She loved her fettuccini as much as she remembered and my chicken parmesan was very good. However, two of the meals at our table seemed to be put under a heat lamp for an extended time with all sauce at the bottom and the pasta hard to chew. The options for allergies is very limited. 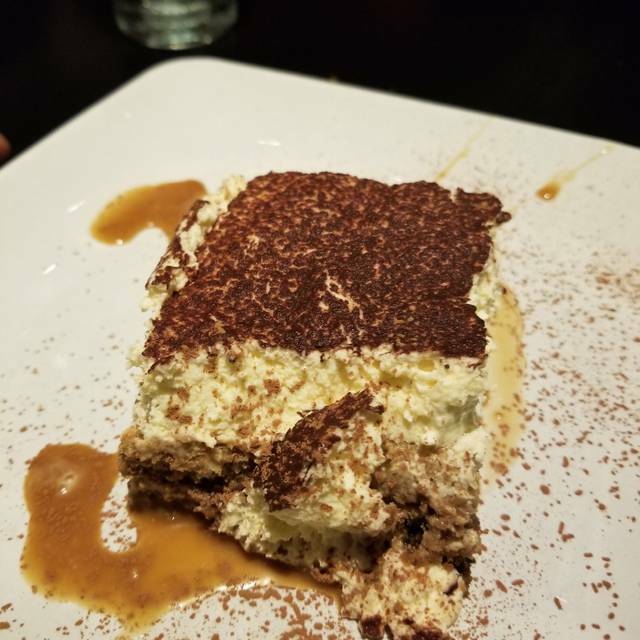 The amount of time we waited for our server initially and between the meal and dessert was extensive. There was also no celebration done for our daughter's birthday. Overall it was disappointing for the group. My daughter will definitely look for other locations to try when we travel but not worth the trip to this one. Went for Sunday brunch which is no longer offered. Bummer! We celebrated out family Christmas at Bravo! It was a wonderful experience for us. Environment was very cozy and enjoyable. All in our party were impressed with the food. My pork chop was the most tender pork chop that I have ever tasted. They take reservations, which was great on Christmas Eve (w/o reservations it was an hour and a half wait). Tables are far enough apart that you don't feel crowded.